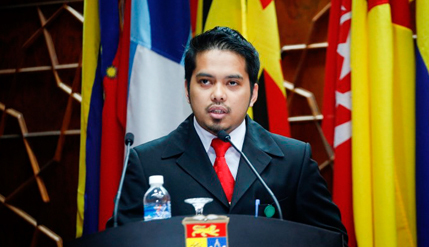 BANGI, 15 December 2014 –The National University of Malaysia Students Union (PMUKM) has pledged to continue supporting UKM’s Vision of maintaining its identity as a “national” university based on its six Key Result Areas (KRAs). The pledge was made by PMUKM President Muhammad Sallehudin Khalid together with his committee members when receiving their credentials for the new university session from the Vice-Chancellor Prof Dato’ Dr Noor Azlan Ghazali here today. Sallehudin said UKM under the leadership of Prof Dato’ Noor Azlan who initiated the six KRAs has successfully raised the university’s status and pledged PMUKM’s support for the university’s philosophy. The student union representing all the UKM students will carry out various efforts with the theme ‘Empowering Students, Leading the Varsity’ to support the management in such endeavours, he said. PMUKM has outlined four principles, ‘A Condusive UKM with Proactive Students’, ‘Summit of Knowledge, Global Reach’, ‘Students’ Devotions, Community Benefits’ and ‘Self Help, Secure Needs’ in support of the university’s move. Sallehudin recalled development of the university during its 44 years of existance and the university’s efforts to retrace all the schools that had donated towards its establishment. He also paid tribute to UKM scholars who had contributed to the upholding of the national well being and education saying that their services should not be forsaken. Present at the ceremony were Deputy Vice-Chancellors Prof Dato’ Dr Mazlin Mokhtar (Research and Innovation), Prof Datin Noor Aziah binti Mohd Awal (Student and Alumni Affairs) and Prof Dr Imran Ho Abdullah (Industry & Community Network).